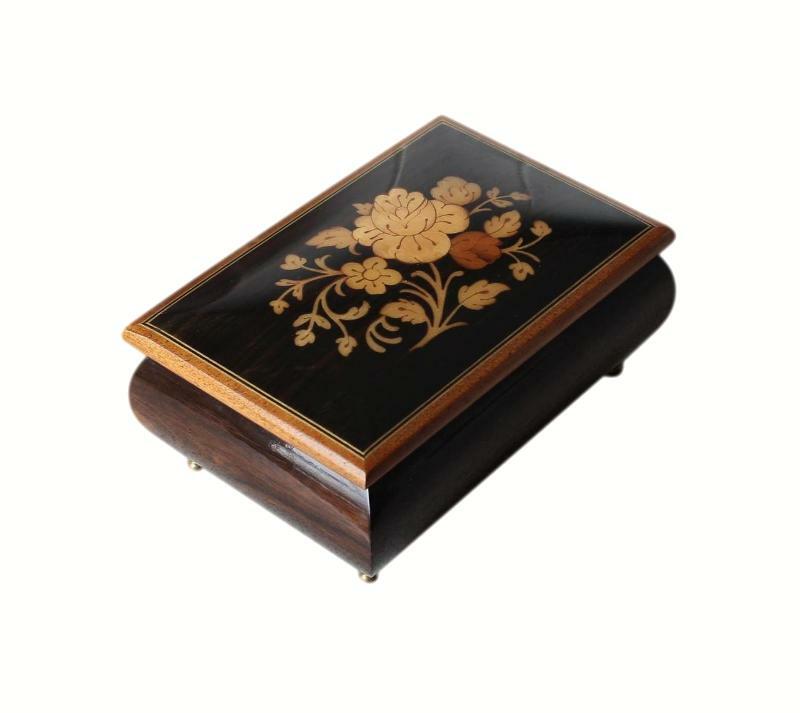 This is a beautiful vintage musical jewellery box. It was made in Sorrento, Italy, and it dates to the 1980s. 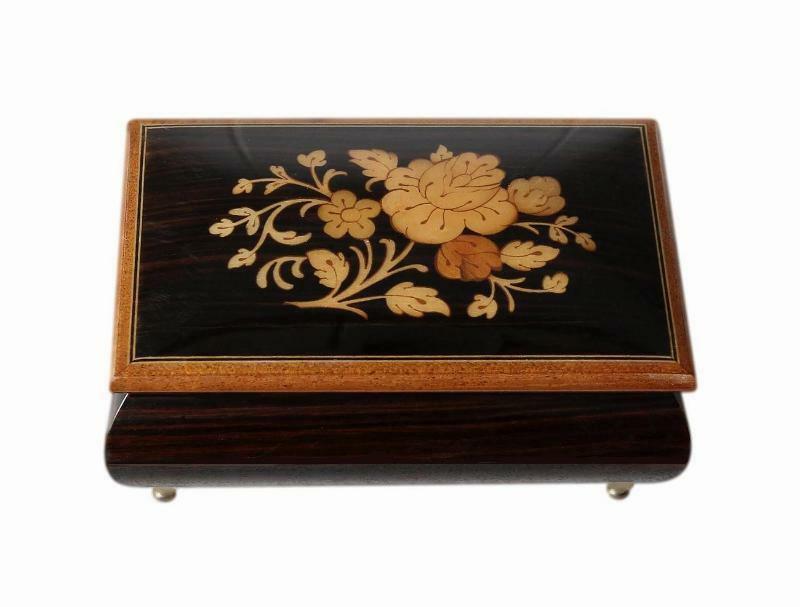 The exterior has a lovely Macassar Ebony veneer which has been polished to a beautiful high gloss finish. The lid has decorative floral inlay which is made up of Satinwood and other various woods. It also has lovely Satinwood stringing. 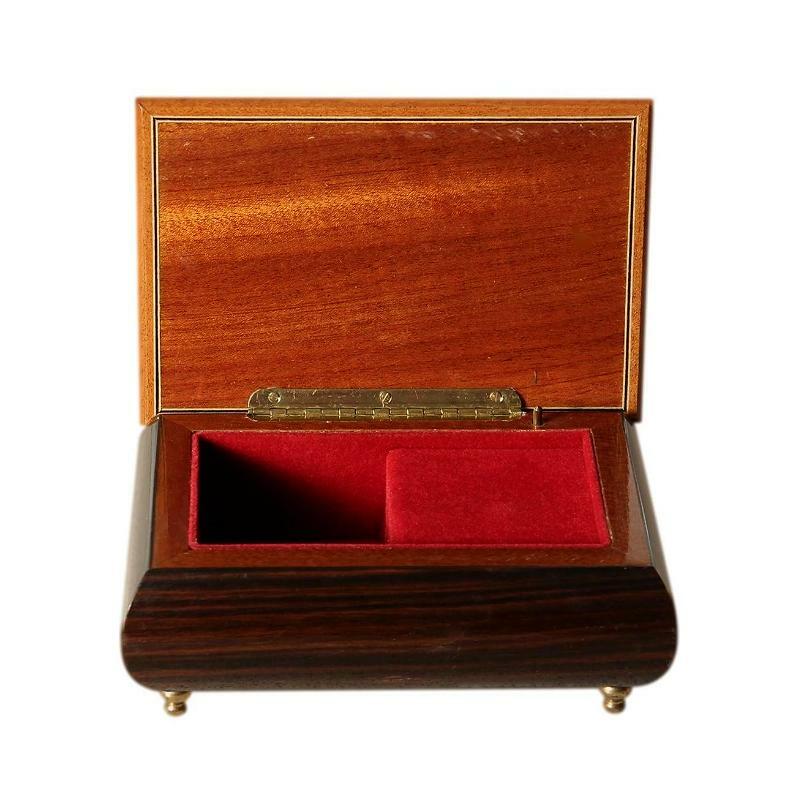 The box is complete with its original gold metal piano hinge. This is a 'stop' hinge which holds the lid upright. The bottom of the box has its original song title label. 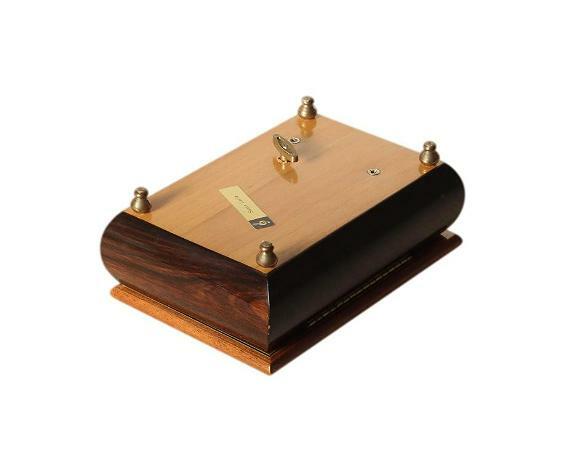 The interior has a single small storage compartment and the musical movement is cased to the right of this. There is shallow storage space upon the ledge of the casing. The interior is fully lined with plush brushed red felt. The movement plays the beautiful tune 'Santa Lucia'. This is a traditional Neapolitan song. It was translated into Italian by Teodoro Cottrau in the 1800s and was the first Neapolitan song to be given Italian lyrics. The movement is in perfect working order, playing the tune at the correct speed. It stops as it should, when the lid is closed, or when the movement has fully unwound. The movement is operated via the winding key on the bottom of the box. 6 turns of the key are sufficient to play the tune in full. Care should be taken not to over wind the movement. Over winding can result in the movement malfunctioning. We are not responsible for musical movements that malfunction after purchase, from further age and use. Please check that the tune is playing correctly as soon as you receive the box. Thank you. This beautiful box is in lovely condition despite its age. All of the inlay is present and intact. The exterior has some minor age related blemishes. There are a few small shallow chips to the veneer but only on the back of the box. The interior linings are in excellent condition with no stains, and no splits or fraying. 6.2 by 5.2cm with a 3.8cm depth. This box will posted FREE within the UK by Next Day Special Delivery.